For Nancy and Daniel Del Monte of Cortlandt Manor, acting out those dozen words has blossomed into a thriving local business that keeps growing: D&N Kitchens & Baths. Serving Westchester and Putnam counties, the 10-year-old company specializes in selling, designing and installing kitchen and baths, including floors, windows, doors, cabinets, countertops and accessories, using tile, granite, quartz and other materials. It has a full-time staff of 10, with three vans on the road. 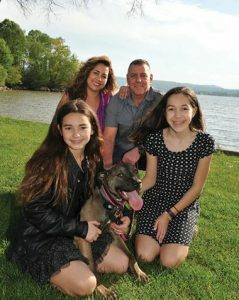 Nancy has lived in Cortlandt since the mid-1980s, when her family moved from the Bronx as she was entering senior year of high school, which she finished at Lakeland High in Yorktown. She has a degree in accounting from Hunter College and was a senior VP of finance at a public relations agency in Manhattan. Dan met her when he was working in the area. “Cortlandt’s got both the city and the country,” Dan says about why they like living here. Both in their mid-forties, Nancy and Dan Del Monte’s path to successful entrepreneurship started in 2005. Dan’s retail management job required long hours at work. “My 2-year-old daughter didn’t even know who I was when I came home,” he laments in retrospective. Seventh-grader Sydnee is now 13 and fifth-grader Sophia is 11. Both are enrolled at Saint Augustine School in Ossining. Dan also was reeling from the loss of his brother-in-law, age 48, with whom he was very close. “That was an eye-opener for me,” he says. “I realized it was time to make a change.” The Long Island native, an avid outdoorsman, always was handy around the house. After contractors he hired did not meet his expectations — especially, he says, in the area of customer service — he began doing more repair and upgrade work himself, whether tile and doors or windows and framing. Dan got his contractor’s license in 2006 and started working out of the house. “He had a Nissan Altima,” says Nancy, “and would put his toolbox in the trunk of his car. Now it’s something tremendous.” They own the showroom-and-office building with “the intention of staying there a long time.” The busy schedule demanded by a six-day-a-week retail and home service business (closed Sundays) leaves little time for vacations. The Del Montes manage to get away for a week once a year to a time share they own in Orlando, Fla.
At home, as time allows, all four family members are immersed in a range of recreational activities. Each has an ATV, which can be used in the wooded area behind their center-hall colonial home on a quiet cul-de-sac. Both girls are excellent dancers, attending Darcy’s Academy of Dance and Performing Arts in Mahopac (N.Y.). They have performed at Madison Square Garden and at Disney World. Sophia and her mom are studying karate at Go No Sen in Peekskill, where Sophia wears a prestigious black belt, with Nancy on track to earn hers next year. The sisters are active participants in community service through Girl Scouts. The family’s pet dog is a 19-month-old rescue, a mixed Labrador-American Staffordshire Terrier (aka pit bull) named Cocoa who has become part of the D&N staff, going to the office with Nancy every day. Dan is a motorcycle enthusiast with a Harley-Davidson Softail. He and fellow bikers have taken rides to Florida’s Key West and used to go to Daytona Bike Week when his daughters were younger. In addition to fishing, bow-hunting deer is a favorite pastime of Dan’s. He gets out as often as possible during the October-December open season. Sydnee has her own bow and hunting license, and is taking safety courses. Her dad says she’ll accompany him when she is “strong enough” to pull back the bow in the field at a safe distance of 20-30 yards from the target. In his early 20s, Dan was in the Army Reserve and as a youth played soccer, baseball and football. These days, he doesn’t even have time to watch sports on TV (although he will make an exception for a hunting program like Duck Dynasty). In the meantime, the business’s growth spurt continues. D&N’s 1500-square foot showroom in Montrose used to be half that size, and the company already is outgrowing the space, so another renovation is underway to enlarge it yet again. One of the newest kitchen and bath materials they recommend is Dekton, a highly-advanced quartz compound made by Consentino. The Del Montes call it “virtually indestructible” because it can be used indoors or outdoors, for countertops or floors, and can withstand hot plates, spilled paint or even a screwdriver nick. The business is a frequent sponsor of community efforts such as Cortlandt Movie Night, Cortlandt Town Day, and the Support Connection Support-a-Walk to fight cancer held each fall in FDR Park. Harking to his early experience with contractors he hired, Dan and Nancy say they “try very hard to give everybody quality of work and customer service that exceed expectations.” He says what inspires him on the job every day is the instant gratification of “doing a job right and having a positive outcome. I get pleasure doing nice work and making our customers happy. They appreciate it.” D&N is fast becoming even more of a family affair. Teenager Sydnee already “has helped design a couple of kitchens,” beams Dan. “Her ideas were part of the final plan, so she clearly has an aptitude for it.” With Sophia only a couple of years behind her sister in age, it may not be long before both of Dan and Nancy’s children are part of the family business, which may call for a name change to D&N&Daughters Kitchens & Baths. D&N Kitchens & Baths is at 2101 Albany Post Road, N.Y. 10548: For more information: (914) 603-3077; DandNcontractor@gmail.com. Do you know a neighbor who has a story to share? Nominate your neighbor to be featured in one of our upcoming issues! Contact us at sgarber@bestversionmedia.com.